Apollo Chamber Players, Origins concert, 10th Anniversary season, March 23, 2018. Photo by Ben Doyle. 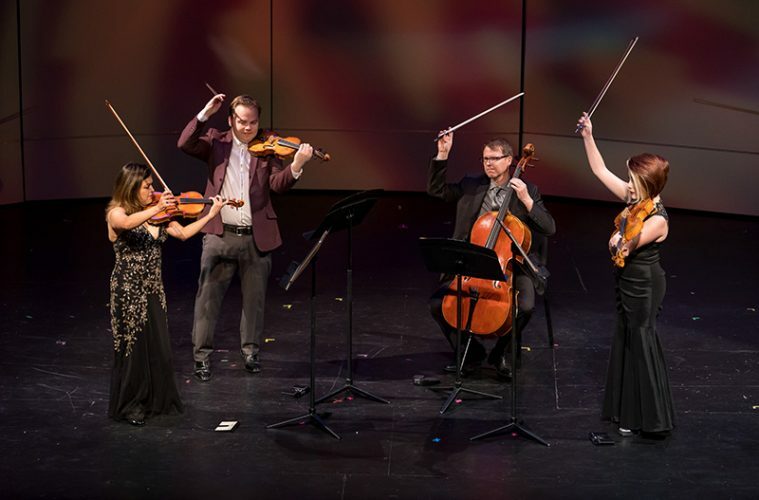 Continuing its unique mission to explore and incorporate diverse folkloric elements and global inspirations while enriching and augmenting the classical repertoire, Apollo Chamber Players embarks on its second decade with fresh ideas and new sounds. The season kicks off with Brazilian Beats on Sept. 29 at the MATCH, featuring the world premiere of Cuban composer Leo Brouwer’s 20×2020 commission inspired by the rhythms of Brazil, as well as a newly-choreographed collaboration with artists from METdance and Houston Ballet. Artistic Director and Co-Founder Matthew Detrick sat down with ACTX’s Sherry Cheng to chat about all the cool happenings in Apollo’s Season 11. ACTX: I’ve been following Apollo for a long time and I was extremely impressed with the scope of your 10th Anniversary season. You were able to bring musical traditions from as far afield as India and Vietnam and give the audience very authentic and compelling concert experiences. We’ve come to expect rich diversity from Apollo. What new global inspirations inform this season’s programming? MATTHEW DETRICK: It was an important milestone for us to reach and now surpass the decade mark. I feel our programming is really starting to ‘click’ as we venture into uncharted territories. To illustrate this point, our season-opening concert, Brazilian Beats, intersects new music, dance, and art – a first for us. Apollo rehearses with METdance for its season opener Brazilian Beats, Sept. 29, 2018 | 8pm, with a Q&A at 7:30pm with Dr. Howard Pollack, University of Houston. Photo by Ben Doyle. Folk Rock features inspirations from the good ‘ole US of A. While discussing commission ideas with composer Pamela Z, she mentioned a love of roots and folk ‘rock’ music of the 1960’s and 70’s. I had given her the parameters of our 20×2020 project (commissions based on folk music), and she shared with me that in her mind, this genre of music was folk music. This was a thought-provoking comment for us. My colleagues and I have long discussed what constitutes ‘folk music’, and decided that this could be an interesting segway to exploring the different variants of this genre over the season, one so important to Apollo. The instrumentation for this commission is super cool, for string quartet, voice and Macbook Pro. In the final concert of the season we travel to Canada with composer Pierre Jalbert to explore his French-Canadian heritage. Pierre (or rather, Dr. Jalbert) was one of my theory professors while I was an undergraduate at Rice; it’s special to now have the opportunity to commission from him. Speaking of commissioning, Apollo is getting close to concluding one of its boldest initiatives, the 20×2020 commissioning project. Can you tell me more about the composers involved in this season’s new commissions? We are beginning to see the light at the end of this commissioning tunnel! In some ways, this season’s roster of project composers is our most eclectic. A short story about Leo Brouwer, who, if our readers might not be aware, is a Cuban composer of almost mythical status. When we launched 20×2020 in 2014, I was perhaps a little too excited about the project and ‘cold emailed’ several very notable composers asking for a commission. One of these was Maestro Brouwer. Fast forward to January 2018 and Brouwer’s manager responds to my now four-year-old email with: “Maestro Brouwer is ready to accept your commission request.” Because his eyesight is deteriorating, they wanted to undertake this right away. I asked the Maestro to choose the commission theme, and he picked the rhythms and beat patterns of Brazil. Initially, we thought about a commission from him for string quartet and guitar, but we decided on a string quartet so we can tour with the piece more easily and frequently. 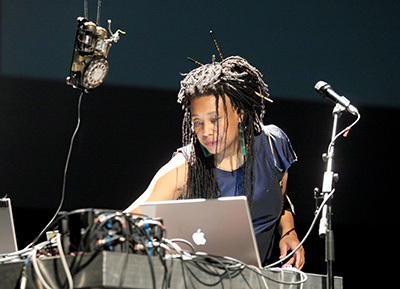 Pamela Z is the 20×2020 composer for Folk Rock March 15 -16 | 8pm @MATCH with FREE ApolloLab at 2pm on 3/16. Photo by Ars Electronica. While many of our nation’s symphony orchestras struggle with inclusive programming – by gender and ethnicity – we feel it’s of utmost importance for Apollo and other chamber ensembles to fill this compositional void. This calling is embedded in our mission statement. Both Leo Brouwer and Pamela Z fulfill this and so much more. I’ve found that if you ask a composer to come up with an idea within 20×2020’s folk music framework, they usually come up with wonderful ideas. Such is the case with Dr. Jalbert, who said this kind of commission request was a first for him. I believe he and his family undertook some ‘fieldwork’ during a trip to Quebec this past summer! I can’t give away any specifics for the final season of the project (2019/20), which will feature the last three composers, but I can say that it will conclude in epic fashion. We will pay homage to the 50th Anniversary of the Apollo 11 moon landing, and explore the music of Nigeria. Apollo has collaborated with many of Houston’s finest performing arts organizations in the past. Can you tell me how the collaboration with METdance and Houston Ballet for Brazilian Beats came about and what that will look like? This past spring, I approached Marlana Doyle, METdance artistic director, about choreographing a music/dance set inspired by this program’s Brazilian and Cuban themes. We’ve worked with her in the past, and I’ve seen her amazing and thoughtful artistry in several different contexts. I knew she would be perfect for this. Meanwhile, when I mentioned the dance element to Lorenzo Martinez, the Cuban-American underwriter of our Leo Brouwer commission, he said: “You should see if Monica Gomez, the Cuban Houston Ballet soloist, can be a part of this.” Monica immediately said yes, and suggested also bringing in her colleague Estheysis Menedez, a recent arrival to the Houston Ballet, also Cuban-born and trained. We’ve collaborated with both METdance and Houston Ballet in past years – at Wortham and Miller Outdoor Theaters with METdance in 2015, and with Houston Ballet for the Texas premiere of ‘Cacti’ in 2016. This is Apollo’s first time presenting artists from these organizations, so it’s a special place for us to be in. Also of note, this program features our inaugural artwork commission, a canvas painting by Brazilian born artist Tony Paraná. Tony has called Houston home since 2007 and his art has most recently been featured as part of the Bayou City Festival. He owns a mobile art unit that he takes to underserved areas of the city to teach and provide access to his art. After I saw his art displayed at the Brazilian Arts Foundation, I immediately knew we had to involve him in the program. I called him up, met him at his studio, and we brainstormed the idea for the new painting, inspired by different elements of the program, to be unveiled at the concert. Houston’s arts scene is all about collaborations, which is more rare that one thinks compared to other large cities. We are honored to share the stage with some of the city’s very best! It is also a privilege to have been awarded a prestigious City’s Initiative grant, bestowed by the City of Houston, in support of this program. I noticed you are doing a holiday concert this year. Is this something new? And will it become a new Apollo tradition? Our Holiday Celebration concert in December is an idea that’s been on the back burner for quite a while. For musicians, the standard Christmas/holiday season music, while beautiful, can get well, a little predictable. So we thought, why not present a concert of folk-inspired holiday music that is fresh and new? This program will include new arrangements of folk-inspired holiday and celebration songs from around the world, representing the countries of Nigeria, Turkey, Korea, Mexico, England, France, and the Jewish faith. We’ve booked six wonderful Houston composers for this project, including current students at Rice and UH. The roster is comprised of Mark Buller, Erberk Eryilmaz, Desmond Ikegwuonu, Jihyun Kim, J.E. Hernandez, and Isabelle Ganz. I would love for this to be a new tradition for Apollo! We are giving this a go as part of a new series at the lovely First Congregational Church. Oh, and perhaps there’s a holiday album that could come of all this. If Josh Groban can do it, Apollo certainly can! The theremin, now there is a radically different sound world Apollo has never explored before! How did this idea come about? The original idea for the Theremin Fantasies program came from hearing Czech composer Bohuslav Martinů’s Fantasia for Theremin, Oboe, Piano, and String Quartet. It was definitely a nice surprise to learn that Martinů, a favorite composer of ours, wrote for this unusual instrument. It turns out that one of the first theremin virtuosos, Lucie Rosen, approached Martinů for a composition featuring the then nascent instrument. The composer responded with this Fantasy, which explores the outer edges of the theremin’s dynamic and color range. 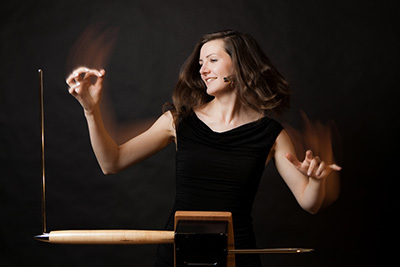 Carolina Eyck will perform as part of Theremin Fantasies Feb. 16, 2019 | 8pm @MATCH. Photo by Ananda Costa. As far as other repertoire for the theremin, there isn’t much out there. I google-searched for the best theremin player in the world, and on the top of the list was Carolina Eyck. Carolina, who lives in Leipzig, Germany, but tours often, has never performed in the Bayou City. We are pleased to show her some Texas hospitality. One of the reasons Carolina was so appealing as a guest artist is because she also composes and sings. She incorporates a vocal line into many of her own compositions, and she just released an album with a new work for theremin and string quartet (Fantasia for Theremin and String Quartet), which we will perform on this program. While we did not commission from her, this was a way to still feature a living composer creating very interesting new art. In addition to Carolina, two wonderful guests will also join us: Elizabeth Priestly Siffert, principal oboe of the Houston Grand Opera, and Alejandro Barrañón, professor of piano at University of Zacatecas. Interesting Houston connection: Alejandro studied at the University of Houston! I know Apollo is committed to educational outreach and entrepreneurship mentoring. What is happening on those fronts this season? We will continue our relationships with Young Audiences of Houston in presenting programs at schools around Houston as well as at Texas Children’s Hospital and a pilot program at MD Anderson. We love talking about entrepreneurship and the business side of running a chamber music organization, which we weave into presentations while on tour. Will Apollo be touring this season? Yes, we’ve been invited by our 20×2020 composer N. Ravikiran to perform as part of his Melharmony Festival in Madison, WI this November. We will perform the commissions he wrote for us, as well as a few new selections in a program raising funds for climate change. Prior to this, in October, we will be bringing Ravi, as we call him, back to Houston to record the commissions for our fourth studio album. We also look forward to being the guest ensemble for a residency at Southern Illinois University this Spring. Professor Chris Walczak, composer of our 20×2020 aboriginal commission, invited us to lecture and perform the main stage concert for the University’s Outside the Box New Music Festival. It’s super gratifying for us to continue meaningful work with our project composers. This has been an exciting year on a personal level for you and fellow Apollo violinist Anabel Ramirez. I mean you two had a baby! Congratulations! How is parenthood? When will baby Xavi be attending your concerts? Yes! A very exciting year. It’s been fun to introduce Xavi to music – he does pretty well watching or playing while we practice. I’ve tried to ‘train’ him since he was just a month or so old, putting him in a rocker and practicing for, well, as long as he would give me! Now he entertains himself on the floor with his toys while Anabel and I learn tricky violin passages. Touring is more of a challenge since Apollo involves both parents, but we’ve managed to make it work so far. We’ve had to improvise a few times. If the caretaker is late, we just put Xavi in his stroller as the fifth member of the ensemble while warming up. The Apollo brood is growing: Along with Xavi and cellist Matthew Dudzik’s two-and-a-half year old son Yuegen, violist Whitney Bullock is expecting this November! All three will be at a concert in the very near future.